We’re finally at my most exciting part of the RHS Wisley Hilltop project – Planting Plans! For a few weeks now, all of us at AMPG have been pouring over books about woodland plants, sunny open spaces, water gardens and evergreens. 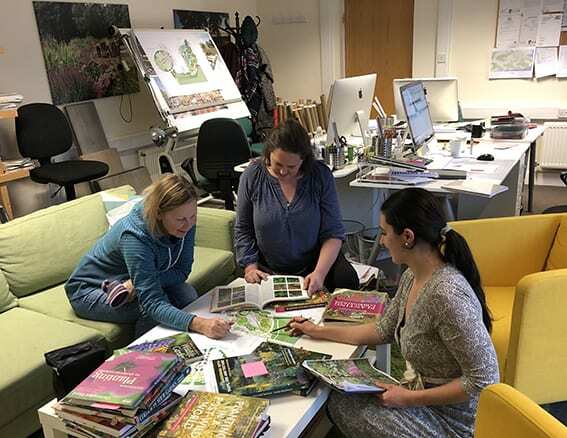 We have been considering growing habits, competitiveness of various plants, hardiness and exposure, colour clashes and complimentary combinations, scent and seed heads – but foremost, as the top priority, we have been talking wildlife value. As we’re working on the Wildlife Garden at the moment, the most important consideration is, of course, how all this wonderful abundance of plants will promote wildlife – not only by providing food and shelter but also by being relatively resilient, so you don’t have to use pesticides. This is such an exciting project and to be able to work with the skilled teams at RHS Wisley is a pleasure. It is easy to forget about all the creatures living in our gardens during the winter months as we don’t tend to spend as much time outdoors, but all the birds and pollinators we’re attracting with an overflowing table during the summer, need something to eat at this time of year, in winter as well. This is the biggest challenge we’re grappling with at the moment; how to extend the feast throughout the whole year. If I could get one wish, it would be that Persephone would spend more time with us in the sun instead of sitting as queen in the Underworld. To get some inspiration for the planting, I spent some time last Saturday walking through Sir Harold Hillier’s Garden in Romsey, looking at what’s in bloom. It was a dreary, rainy day, but still an exuberant experience. I could have moved through the garden with my eyes closed, following the scents from the different Daphnes, Hamamelis, Mahonia, Sarcococca and Chimonanthus praecox. It was intoxicating, and as most of the garden still was in winter mode, you could focus on plants which are easily overlooked when the green overflow of spring comes back. The Hellebores were of course out, as well as the snowdrops and Cyclamen. Insects were already zooming around, collecting nectar, and plenty of rosehips and berries were still available for the birds. I had a Red Robin accompanying me, hopping from Daphne to Daphne – making me wish I could live in such a perfumed space as well. Back at the proverbial drawing board the planting beds are slowly filling up, plants are getting moved around, combined with something new, and sometimes discarded. A constant discussion about their benefits is going on and frustration expressed when we can’t find the perfect plant for what we want to create, but the tapestry is growing. What could be more satisfying from a day at work!